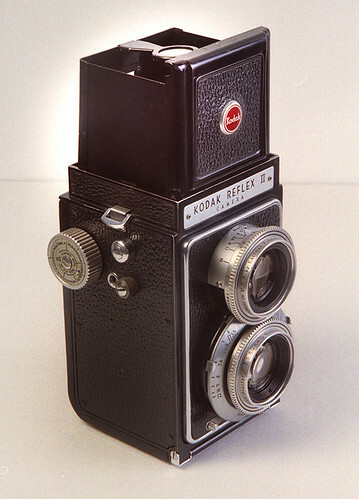 The Kodak Reflex II is a TLR camera that made 2¼×2¼ inch exposures on 620 rollfilm. By fitting an adapter you could also use 828 film. 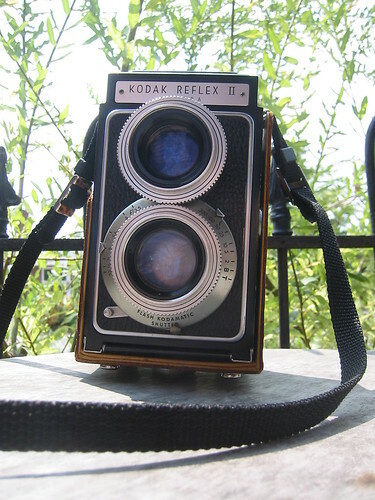 It was manufactured by Kodak from 1948 to 1949 and was a slightly improved model of the Kodak Reflex. It has a Kodak Anastar 80mm lens made of four elements with an aperture range of f/3.5 to f/22. A diagram that shows how to disassemble the lenses and shutter of the Kodak Reflex II at Rick Oleson's page. Repair tutorials on cleaning the view finder, the winding mechanism, shutter disassembly and collimating the lenses of the Kodak Reflex II on flickr . This page was last edited on 17 March 2018, at 19:35.